First things first. 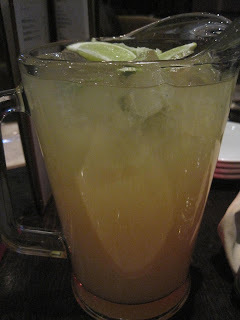 While Mel chatted away with one of our colleagues, Patty & I took it upon ourselves to order a pitcher of margaritas (a happy hour special). I definitely felt like the first round was strong, even if there was a little too much orange juice in this version for me. Rounds 2 and 3 (calm yourself, we were a big group) were muuuuch weaker, and we were definitely disappointed at how watered-down these were. The food, however, did not disappoint. 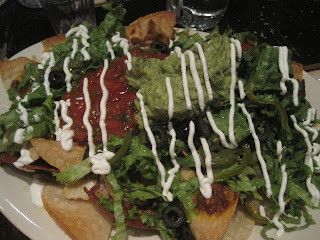 We started with the Rattlesnake Nachos. There is no actual rattlesnake in the nachos, so I'm guessing the shredded ribbons of Romaine lettuce are meant to evoke reptilian images? I suppose the sour cream drizzle had a side-winder look to them. Whatever the reason behind the name, these were delicious and we ate them up right quick. 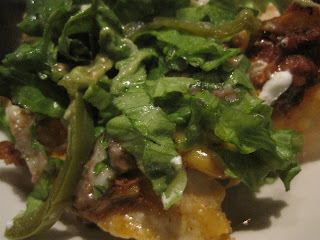 Crispy, thin chips weighed down with beans, chili, lots o'jalapenos, and cheese. My only complaint is that they are described as being covered in four cheeses, but most of my pieces were cheeseless. Tasty, but cheeseless! Birthday gal Mel got the burrito, which was super grande. 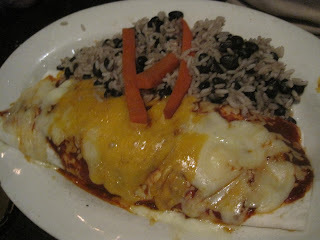 They call it a 'wet' burrito, because it's smothered in sauce, but I gotta say, that's not a very appetizing word for me when it comes to food. sheesh. Mel says this was pretty good--not the best burrito she's ever had, but it was good! It was also a huge serving of food--I don't think she even finished it. I darn near finished my whole entrée, though! 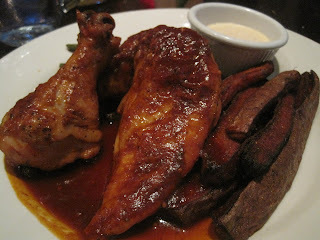 I got the BBQ chicken, which came with sweet potato fries and blackened green beans. The chicken was downright succulent (and I use that word when I REALLY mean it) and well-seasoned, the sauce was tangy and not-too-sweet, but the green beans, they stole the show. Holy veggies, Batman, were these green beans good (even if you can't really see them in the food photo). They were salty, garlicky, and addictive. If I had not filled up that space with margaritas already, I would have cleaned my plate. Fortunately one of my coworkers was a fan, too, so she helped me finish them off at the end. The fries came with a spicy dipping sauce that was delicious on everything. Be warned--there is some kick to this dish--it's not for the faint of tastebuds. The service was a little weird--we told our first server that we were celebrating a birthday, but about 20 minutes later we got a new server, and I guess she didn't get the memo. We saw, after we'd left our seat, that they put sparklies on a piece of cake or something if it's a bday, but our dear Mel got no fanfare. :( Also, we were seated quickly but told we could only have the table for 2 hours, as it was reserved after that. We agreed gladly, as we were starving, but then we felt a little stalked when the hostess came up and gave us a 1-hour warning (the late arrivers to our party were told to hurry up and order food as we ONLY had just over an hour left. How long does it take to bring out food?? 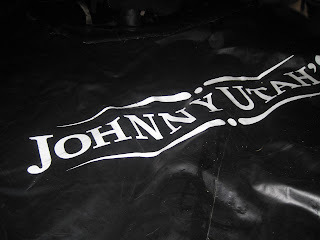 In this case, 10 minutes.) We also got a 30 minute, 15 minute, and a few more nudges. We were actually waiting a good 15 minutes for the server to come take our cards, so when the hostess swooped in one more time, I was quick to point out that we were more than happy to vacate, but we had this little issue of paying for our food. She took the cards and told us we could go wait in the (packed) bar area and she'd come find us. I opted to wait at the table so I could be sure to get my credit card returned. With all the delays, I was sure there would be an antsy group waiting to sit down in our spots. 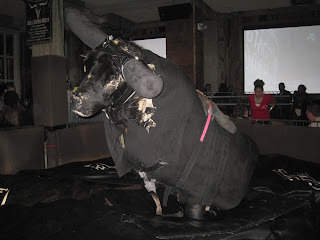 However, we stayed for another 45 minutes to an hour (to watch some friends ride the bull--yee haw! ), and our seats remained empty. Feh. Just annoying. 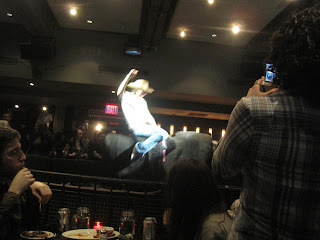 Long story short: good food, so-so drinks, super fun bull-riding! It's worth a pop in at least once! And while she didn't get a cake with sparklers, I hope Mel still had a rootin-tootin' good time! Happy Birthday, Mel!